Peristaltic Pumps have the most gentle movement of wine/must pumps. Thanks to the coupling to the hopper (optional) is possible to transfer mash consistency fluids, dregs, destemmed grapes and other alimentary products. The type or work assure a linear pumping, limited squashing and a complete absence of product heating. Rubber hose is compressed by rotating aluminum rollers mounted on bearings for minimum friction. The rubber hose is lubricated at the factory with food grade lubricant and does not need periodic lubrication. The machine is entirely manufactured in stainless steel, including the components not in direct contact with the pumped fluid. Variable Speed Frequency Drive on all units. Local and Remote controls [forward/reverse, stop/start, and speed]. Hose is lubrication-free. Food grade hose is lubricated during manufacturing and does not need periodic lubrication. 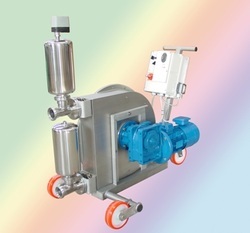 Choose between integrated and free-standing; Integrated hoppers connect directly to the pumps---inlet flange of pump is bolted to outlet flange of hopper. Stainless steel hopper and auger. Motor with gear reduction. Takes ~15 minutes to attach/remove the hopper. Optional For all units. Pressure switch Adjustable: Prevents back-flow through pump (when pump is turned off) up to 35 psi. It keeps the pump under pressure to prevent flow in reverse direction.